204093 Private Samuel Westaway Burnett of the 7th Battalion, the Norfolk Regiment. Son of Charles and Lucy Burnett of Cornwood. Born in Ivybridge in 1898/ Died 23 September 1917 aged 19. 5715 Private Rupert Downing of the 1st/4th Battalion, the Devonshire Regiment. Stepson of Robert and Alice Braunton. Born in Ermington in 1899. Died 3 February 1917 aged 18. Acting Battalion Quarter Master Sergeant Albert Enos Dyer of the 15th Ammunition Column, the Royal Field Artillery. Son of William and Frances Dyer. Born in Woking in 1887. Died 17 February 1919 aged 32. Awarded the Military Medal with 2 Clasps. Private William Henry Ede of the Royal Marine Light Infantry. Son of William and Jane Ede of Smallbridge, Cornwood. Born in Cornwood in the September Quarter of 1896. Died 23 April 1918 aged 21. 77306 Sapper Ernest Edward Harvey of the Cable Section, the Royal Engineers. Son of Elizabeth Harvey (widow). Born in Cornwood in 1883. Died 12 May 1916 aged 33. 1030 Sapper William Francis Horton of the 3rd Company (Tunnelling), the Australian Infantry Force. Son of Trowbridge and Mary Ann Horton. Born in Cornwood in 1891. Died 27 November 1916 aged 27. Emigrated to Australia in 1913. Not found in CWGC. He came out of retirement to serve his country so details are sketchy. 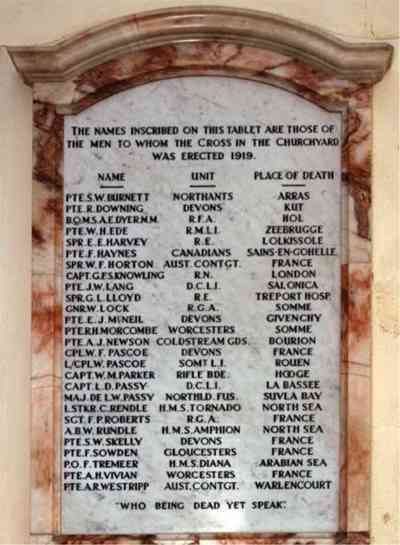 Commander George Francis Savage Knowling, RN Retired List. (MD of local Brewery in 1911). Born in East Stonehouse 14 April 1854. Husband of Dorothy Knowling of Glebe House, Cornwood. Died at his London home (Chelsea) 8 February 1919 aged 65. (No service details available) Awarded the Victory Medal and the British War Medal. 11336 Private John William Lang of the 8th Battalion, the Duke of Cornwall's Light Infantry. Son of John and Eliza Jane Lang. Born in South Brent in 1893. Died 17 March 1917 aged 24. 19963 Sapper George Lawson Lloyd of the 12th Field Company, the Royal Engineers. Son of Peter and Mary Lloyd. Born in Dudley, Worcs in the September Quarter of 1888/ Died 17 August 1915 aged 27. 329923 Gunner William John Lock of the Royal Garrison Artillery. Son of George and Mary Lock. Born in Cornwood in 1895. Died 21 March 1918 aged 23. Our thanks to John Evans who kindly provided additional information for this entry. 6992 Private Ernest John McNeil of the Devonshire Regiment. Son of Donald and Sarah Jane McNeil. Born in Cornwood in the December Quarter of 1881, Died 25 October 1914 aged 32. 4858 Private Henry Morcombe of the 1st/7th Battalion, the Worcestershire Regiment. Son of George and Mary Ann Morcombe. Born in Staverton in 1886. Died 21 August 1916 aged 30. 9861 Private Alfred John Newson of the Coldstream Guards. Son of George and Emma Newson. Born in Plympton in the March Quarter of 1889. Died 8 September 1914 aged 25. Captain William Mackworth Parker, adjutant of the 8th Battalion, the Rifle Brigade. Son of Lieut-Col W. F. Parker of Delamore House, Cornwood; husband of Ursula née Vivian, Born 1 September 1886. Died 30 July 1915 aged 29. Won the Sword of Honour at Sandhurst. 30635 Corporal William Frank Pascoe of the 1st Battalion, the Devonshire Regiment. Son of Wallace and Fanny Pascoe; brother of Wallace (see below). Born in Cornwood in 1893. Died 23 April 1917 aged 24. 28965 Lance Corporal Wallace Pascoe of the 7th Battalion, the Somerset Light Infantry. Son of Wallace and Fanny Pascoe; brother of William (above). Born in Cornwood in 1899. Died 21 October 1914 aged 33. Captain Logan Deare Passy of the 1st Battalion, the Duke of Cornwall's Light Infantry. Son of Captain de Lacy Passy (see next entry) and A. M. Passy; brother of Major Passy (see below); husband of Ethel Passy. Born in 1881. Died 21 October 1914 aged 33. Major de Lacy Woolrich Passy of the Northumberland Fusiliers, attached to the 25th Punjabis Son of Mrs A. M. Passy and the late Captain de Lacy Darrel Passy of the 4th Madras Piuoneers; husband of Norah Passy of Earl's Court. Born in 1878. Died 12 August 1915 aged 37. Leading Stoker Charles John Rendle of the Royal Navy, HMS Tornado. Son of George and Lavinia Rendle of Gorah, Cornwood. Born in Cornwood 19 November 1887. Died 23 December 1917 aged 30. 31031 Sergeant Frederick Putt Roberts of the 277th Siege Battery, the Royal Garrison Artillery. Son of Henry Roberts of Asherne Lodge, Strete, Nr. Dartmouth. Born in Cornwood in 1893. Died 15 September 1918 aged 25. Able Seaman, Armourer's Crew William H. Rundle of the Royal Navy, HMS Impregnable. Son of Sarah Rundle and the late John Rundle. Born in 1898. Died of illness 29 June 1918 aged 20. 1436 Private Shirley William Kelly of the 33rd Battalion, the Australian Infantry Force. Died 8 June 1917. History of the family not known. 25376 Private Frederick Sowden of the 8th Battalion, the Gloucestershire Regiment. Son of the late John and Elizabeth Sowden of Lutton, Cornwood. Born in 1886. Died 3 July 1916 aged 30. 159519 Petty Officer Felix Tremeer of the Royal Navy, HMS Diana. Husband of Lois Tremeer of Stone, Cornwood, Born in 1872. Died 2 November 1918 aged 46. 57397 Private Albert Henry Vivian of the 3rd Battalion, the Worcestershire Regiment. Husband of Florence Vivian. Born in Cornwood in 1870. Died 19 October 1918 aged 48. Post Master of Cornwood. 1591 Private Albert Richard Westripp of the 25th Battalion, the Australian Infantry Force. Believed to have been born in Australia. Died 7 February 1917 aged 19. "I last saw him on February 7th 1917 at Le Sars, at about 4 pm, in our front line. He was killed by a shell which got him in the head, killing him instantly." (Signed) Leiut. W. Harrison of "C" Coy.